While eating a tree may not sound very appetizing, many types of tree bark are actually edible and quite nutritious. If you ever find yourself in a situation in which you’re lost in the woods or experiencing a major disaster without access to food, it could actually save your life. Tree bark is considered safe as well as healthy as long as you’re using the right part of the bark, and from the right species. This layer of bark is referred to as the cambium layer, found right next to the wood. Many of our ancestors used this edible inner layer for food and medicine, and in many Native American cultures it was used as an important dietary staple. 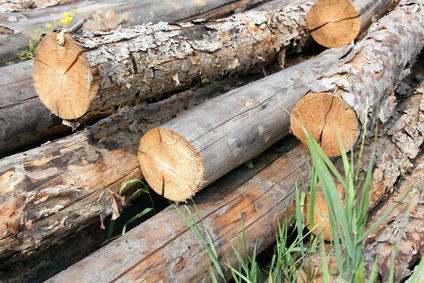 Pine is generally the best choice in the Northern Hemisphere; it was the type of bark used by most of our predecessors. Both the inner bark and nuts of the pine tree can be used as a food source, and its needles can be chopped and steeped in boiling water to make pine needle tea, which contains five times the daily requirement of vitamin C.
If there are pines in your area that are being cut during logging or thinning operations, you might consider harvesting some tree bark for food. Otherwise you should wait until you are actually in a dire food emergency. In order to utilize the bark, a fresh tree is required. If you wait too long after it falls or is cut, the bark will be difficult to remove from the tree. On a fresh tree it can be removed easily, coming off in large slippery sheets. First remove the rough outer bark and the living inner bark from the trunk with a chopping tool, and cut a straight line completely through the layers of bark down to the hard wood. Next, slide the edge of a tool into the cut that was made so that it is forced between the bark and the wood. By working the edged tool back and forth, the bark will loosen and can be easily removed from the wood. Raw pine bark is generally too fibrous to eat, but if you fry the slabs in some oil until they’re crisp, it actually becomes rather tasty, somewhat similar to a potato chip. You can also make flour from the bark by drying it out in the sun or on a rack. It takes about a day or so to dry, depending on the weather and the size of each strip of bark. Once it has dried, you can put the pieces into a blender or food processor, pulsing until the bark turns to powder, and then store it in a cool, dark place. Just a little knowledge like this can help you survive should the unthinkable happen! Hey Buddy!, I found this information for you: "Could Tree Bark Keep You Alive?". Here is the website link: https://www.thealternativedaily.com/tree-bark-keep-alive/. Thank you.